In the tradition of oriental medicine, health and well being arises through the cultivation of our vital life force — our chi. Chi flows through the whole body, mind, and spirit providing nourishment and warmth to our entire existence. Thus it is only through the free flow of chi within ourselves that health and resistance to illness is fortified. The Chinese sages perceived that the outer world was also full of chi moving through its fluctuations as expressed through the seasons of the year. By observing nature — the stars, the sun, the moon, the oceans and rivers — the sages developed a system of medicine to restore balance and health. This system includes acupuncture, herbs, food therapy, and movement therapies. After thousands of years, the profundity of their insight is still amazing to witness and experience. Fundamental to all of Chinese medicine is the practice of chi gong or cultivation of chi. There are many forms of chi gong, including the animal forms, the 8 Methods of Taijiquan and the 63 movement yang style short form of Taijiquan. They all cultivate health through gentle movement and breathing, promoting the free flow of chi and gathering of chi. In order to embrace the chi, one of the most important principles is found in the Chinese word sung, often translated as “relax” and “to loosen”. Sung is the essence of Taijiquan. Through daily practice, we learn how to authentically relax, integrating balance and harmony into our lives. We learn how to transform fear into fearlessness and to become gentle yet strong human beings. When the chi is not free flowing due to chronic stress of many kinds, one may experience frequent flus, head colds, pain, fatigue, headaches, menstrual cramps, fear or depression for example. The master Taijiquan teacher, Professor Zheng Manqing, said it is easy to relax the body and difficult to relax the mind. Yet the wisdom of Taijiquan gradually teaches us, through much practice, how to relax the body and the mind. Professor Zheng stated in his 13 Treatises that one should “seek the released mind” or “the true mind” for the greatest health. As this is cultivated, the spirit can flourish, and health shines forth. To practice Taijiquan is both easy and difficult, immediately awakening intrinsic health, yet requiring great perseverance. Practicing Taijiquan teaches us how to move from within, creating balance and centeredness in any moment of life. Potentially, these skillful means can extend from helping ourselves to helping others. 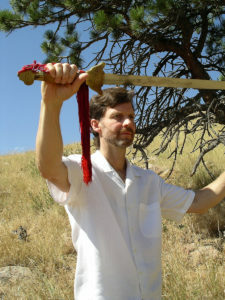 Larry Welsh has trained in the Taijiquan Yang style short form, listening hands and sword form for 40 years. He is senior adjunct professor in the Wisdom Studies program at Naropa University. He practices Japanese Classical Acupuncture, Herbal Medicine, and Whole Food Nutrition in Boulder, Colorado. He was senior acupuncturist at Bridges Integrative Health Services, a part of Lutheran Medical Center in Wheat Ridge, Colorado from 1999 to 2012. He has been a meditation teacher and practitioner since 1977. He teaches Tai Chi and Mindfulness Meditation to private classes.